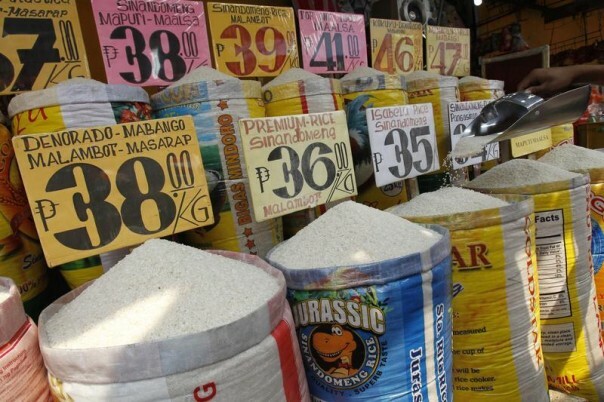 Sacks of rice for sale are displayed at a market in Manila, March 5, 2014. 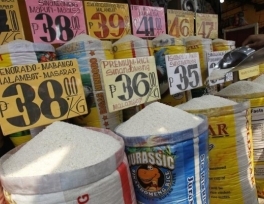 The Food and Agriculture Organisation's (FAO) price index, which measures monthly price changes for a basket of cereals, oilseeds, dairy, meat and sugar, averaged 208.1 points in February, up 5.2 points from a slightly revised January index of 202.9. Unfavourable weather conditions in the southern hemisphere and parts of the United States were the most important cause of the rises, FAO's senior economist Abdolreza Abbassian said. However, he said market nervousness about the crisis in Ukraine could affect prices in March. "The situation in the Black Sea has created a certain level of worry in the markets. It's difficult to predict how this is going to unfold but obviously we are in a very short-term price shock situation," Abbassian said. "Things could come back to normal once the Ukraine situation improves. Otherwise there could be more volatility in the markets for the foreseeable future." Markets are carefully watching a developing crisis over a Russian military intervention in the Crimea region of Ukraine, the world's sixth-largest wheat exporter which ships to Egypt and other import-dependent countries in the Middle East and North Africa. In February prices rose in all commodity groups except meat. The strongest rise was in the sugar sub-index, up 6.2 percent from January due to concerns of crop damage from dry weather in Brazil and forecasts indicating a drop of output in India. The vegetable oil price index rose 4.9 percent on the previous month, the second-largest increase among the indices after sugar. This was driven by strengthening palm and soy oil prices due to dry weather in Southeast Asia and South America. A 3.6 rise in the cereal price index reflects concerns over the effect of freezing weather on wheat crops in the United States, FAO said. The last time the food price index rose so significantly was in July 2012 due to a drought in the U.S. Midwest which sent corn and soybean prices to record highs. At the time, this sparked fears of a repeat of a food crisis in 2007/08 in which major producers restricted exports in an attempt to control domestic prices. However, stocks are currently ample. FAO raised its forecast for 2013 world cereal production to a record 2.515 billion tonnes on Thursday, up 13 million tonnes from its previous forecast and said the early outlook for 2014 wheat production is favourable. The FAO raised world cereal stocks forecasts for end-2014 season slightly to 578.5 million tonnes, meaning they would be 14.5 percent above their reduced opening levels and the highest in 12 years, FAO said. The rise in the 2013 forecast for world cereal production was due to higher estimates from Australia, which has just concluded its winter grain harvest, and upward revisions for China's wheat and coarse gains crops. Though it is too early to forecast global cereal output for 2014, FAO gave its first world wheat output forecast for the year at 704 million tonnes. This was a drop of 1.7 percent from the 2013 record harvest, but would still be the second largest crop ever, FAO said.